Chelsea today took all three points from a game that they would arguably have dropped some in last season, in fact it was a fixture that they lost 1-0 two seasons ago. The Blues’ title credentials were tested by a QPR side who showed determination, but ultimately a lack of quality. Diego Costa returned to the starting line-up in place of Didier Drogba; the only change to the team that started against Manchester United last Sunday. Branislav Ivanovic, having served his one-game ban against Shrewsbury in the League Cup on Tuesday, continued at right-back. Chelsea started the brightest of the two, with an early flurry of corners and a chance put a yard the wrong side of the near post by Ivanovic. QPR, however, also showed intent, with Charlie Austin heading a looped cross just over the bar. Chelsea continued to probe and eventually got their reward with a beautifully taken strike on the half-hour mark. Cesc Fabregas showed some tidy footwork on the edge of the 18-yard-box before rolling the ball into the path of the oncoming Oscar, whose shot with the outside of the boot curled around Rob Green and nestled into the far corner. As the light started to fade in the second half, the atmosphere turned more and more tense. Neither team could carve out more than a half-chance, and on 60 minutes Bobby Zamora was brought on to increase QPR’s firepower upfront. Harry Redknapp’s boldness paid off a couple of minutes later when, following a swift counter-attack down Chelsea’s left hand side, QPR equalised. Courtois parried a driven effort to the edge of the box, which was volleyed back towards the danger-area and turned in cleverly by Charlie Austin. QPR continued to threaten, with a deflected Sandro shot creeping just inches wide. 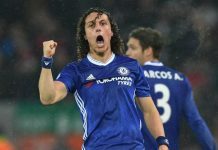 Chelsea managed to settle on the ball, however, after bringing on veteran Didier Drogba, but they continued to look susceptible to a QPR counter-attack. The Blues nearly paid the price for their attacking intent when a foul on Diego Costa was not given and QPR broke towards goal. Austin, however, skewed his shot wide. With fifteen minutes left, Eden Hazard darted into the box, as he so often does, and won a penalty after he was brought down by Vargas. 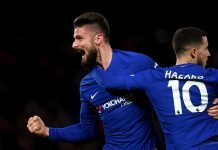 The Belgian then showed again why he has been chosen to take Chelsea’s penalties; after showing no fear he sent Green the wrong way and restored Chelsea’s lead. Diego Costa was then brought off in place of André Schurrle, having put in a tireless shift on his return from injury. Chelsea nearly extended their lead after Terry diverted a corner goal-wards, but Green parried well and the ball was cleared. By this point, however, QPR seemed to have run out of steam and Chelsea’s main objective was to keep possession, and if possible nick a third. Next articleCan you buy success in the Premier League?